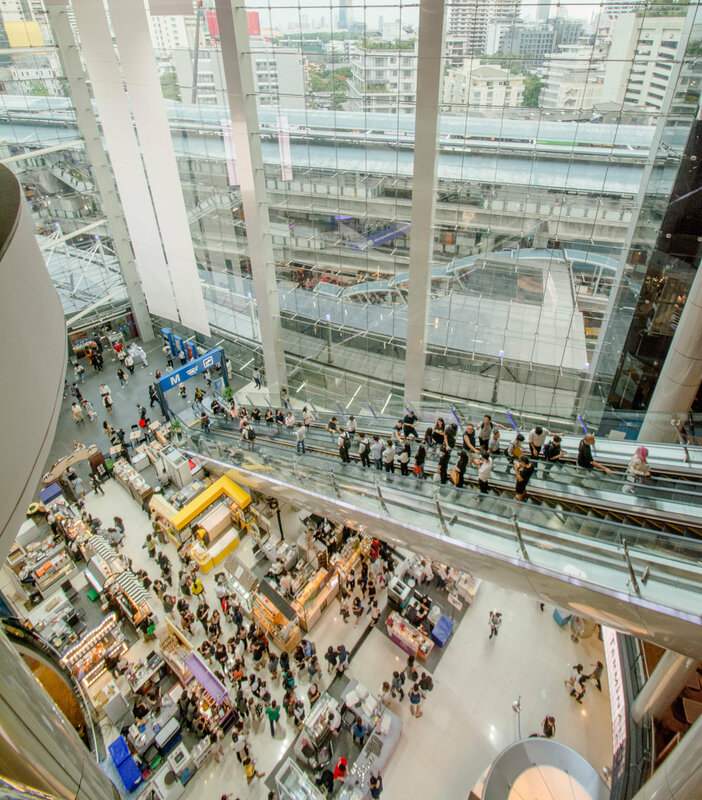 There is an noticeable clustering of shopping malls in the "new town" of Bangkok, the modernizing eastern section of the city where luxury high-rise developments and high-end retail can be found in abundance. In contrast, the historic west end of town is popular among tourists hoping to visit temples, Khao San Road (a raucous nightlife haven) and the Grand Palace. There, retail primarily consists of jewelry stores, souvenir shops, restaurants and bars; nearby Chinatown boasts a thriving network of local businesses selling everything from motorbikes parts to furniture. Many pedestrian markets in "new" Bangkok occur adjacent to—or even within—shopping malls. Bangkok's recent bans on street food in many locations have cast doubt on the ability of vendors to continue operating on an informal level, and the built environment surrounding many of the city's shopping malls is simply not conducive to the kind of street commerce found in older neighborhoods. Perhaps commerce and retail organizations in new Bangkok are filling a void once occupied by street vendors when districts like Ratchathewi resembled the commercial hubs of Hanoi's Old Quarter or Ho Chi Minh City's District 1. These newfangled "street markets" may look and smell like those original gatherings still dotted throughout Bangkok's older alleyway neighborhoods. Though their turf grass and modern veneer betray any presumptions of authenticity—at least in the traditional sense of street food—they do offer faithful enough versions of the street food classics that gave Bangkok its reputation in the first place. We cannot know for sure that the many traditional Bangkok street markets will survive in an informal capacity or be fully transformed into centralized, consolidated affairs removed from their original urban contexts. We lament the loss of vibrant streetscapes where cultures and cuisines thrive, but perhaps we may at least recognize these new markets as opportunities to preserve those traditions within a rapidly-evolving metropolis.